Election 2019 kicked off to a troubled start on Thursday with two people being killed in clashes in Andhra Pradesh, an IED blast in Maharashtra, reports of EVM glitches and multiple complaints from voters about their names not being on the electoral list. There were reports of violence from Andhra Pradesh, Maharashtra and Chhattisgarh while the chiefs of several parties, including TDP's N Chandrababu Naidu, AAP's Arvind Kejriwal and PDP's Mehbooba Mufti, came forward to complain about administrative and other lapses. Condemning the killing of his party worker, TDP president Chandrababu Naidu accused the YSR Congress of indulging in violence to win the election. The opposition countered it by saying followers of local TDP MP and MLA, the JC brothers (MP J C Diwakar Reddy and MLA J C Prabhakar Reddy) tried to rig votes in a polling booth in Veerapuram village. The two parties clashed in other parts of the state as well with reports of stone throwing and allegations of attacks and vandalism coming in from Eluru city as well as from Jammalamadugu in Kadapa district and Narsaraopet constituency in Guntur district. In the Naxal stronghold of Chhattigarh, four guerrillas were arrested and firearms seized from them in Bijapur district while the poll process was underway. In the early hours of the morning, Naxals detonated an IED in Narayanpur in Bastar region. No casualties were reported here too. Many miles away, an IED was detected in an oil pipeline passing through a tea garden in Assam's Dibrugarh district. Security forces rushed to the spot to ensure there is no trouble. "No developed country is using EVMs as they are prone to manipulation. We have hence been demanding that we revert to the ballot paper system," Naidu said after casting his vote in Undavalli village in Amravati amid numerous reports of EVMs not functioning properly. "What is happening EC? Are these elections fair?" Kejriwal asked. Businessperson Kiran Mazumdar Shaw's mother was one of those whose name was deleted. "My mother's voter ID has been deleted on some flimsy excuse that there was a report that she no longer lives at her address. She is so upset I can't tell you becos she has been at the same address for 19 years. So much for 'verification'," Shaw said in a tweet. In Jammu and Kashmir, the National Conference and the PDP alleged that uniformed personnel coerced people to vote for the BJP and EVMs malfunctioned in some places with the Congress button not working during polling in Jammu's Poonch area. "Using armed forces at polling stations to coerce people to vote for the BJP shows their desperation & hunger to usurp power by hook or crook," PDP president Mehbooba Mufti said in her tweet. According to National Conference's Jammu provincial president Davinder Singh Rana, a uniformed officer coerced voters in Poonch's Arai Malka area to vote for the BJP. 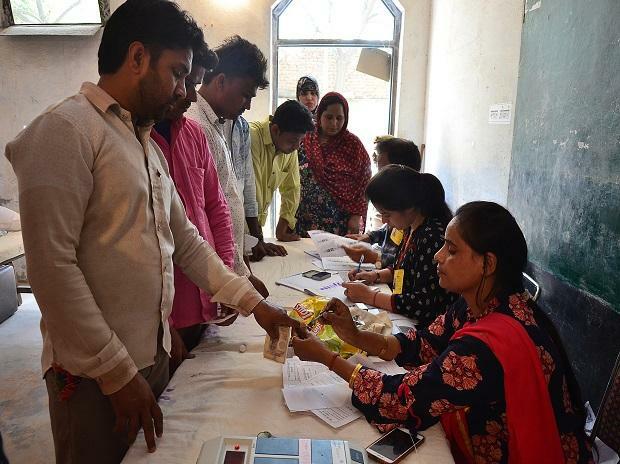 More than 14 crore people are listed to vote in the first phase, held in 91 Lok Sabha constituencies spread across 18 states and two union territories. The votes for the election, being held over seven phases, will be counted on May 23.